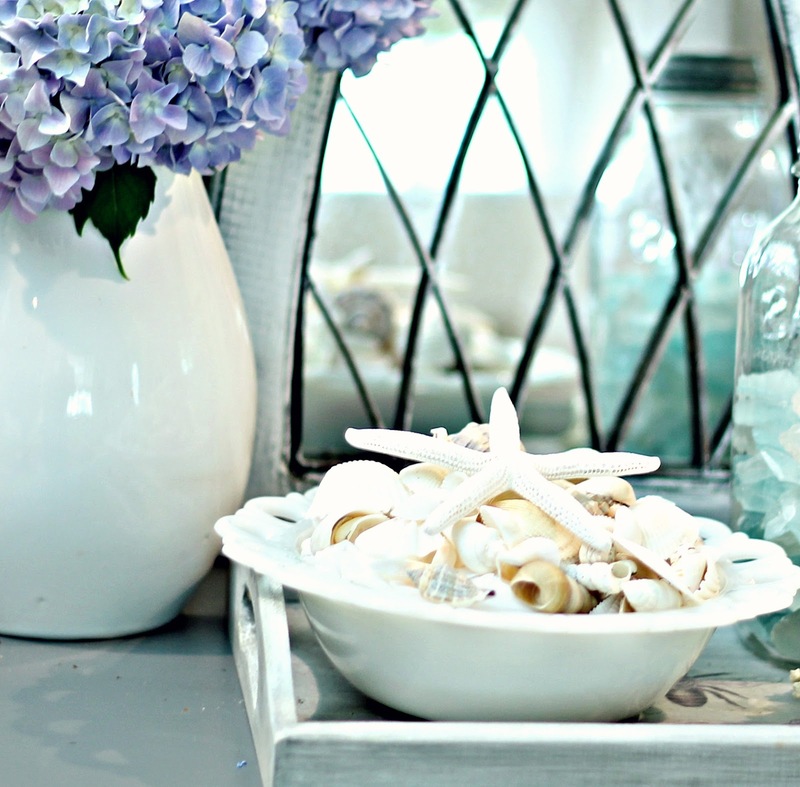 I decided to do a summer vignette on my favorite surface to play with, my buffet. This thing has turned into my own little decorating lab. A small house makes you get creative with what you have. It's a fun challenge to try and keep things interesting but not cluttered and busy in 1200 square feet. I kind of wanted it a little beachy but not in a typical way. I drove everybody nuts moving and changing things about a million times. I moved my lamps from the side tables and added them to the buffet. The hydrangeas are courtesy of my garden's Nikko Blue and Blue Wave shrubs. I added sea glass to a vintage mason jar that I found at a thrift store, love the zinc lid. I added sea shells to a milk glass bowl and placed them on my bumble bee tray along with a piece of coral. I bought the lantern at the Christmas Tree Shoppe. It's deep and wide and as soon as I saw it I knew it would be perfect for making vignettes or an assemblage. I added coral, shells, a sea fan and a candle inside. 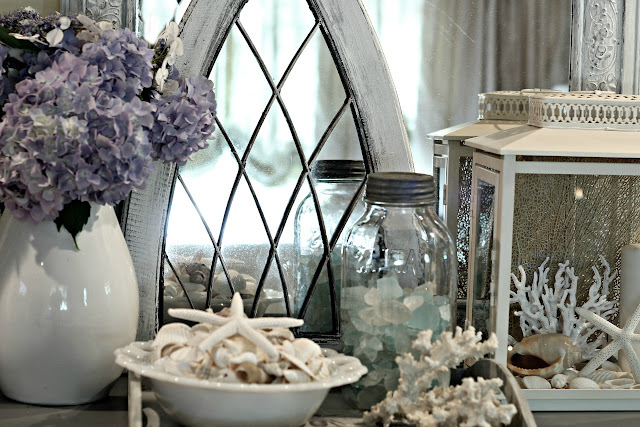 What a pretty vignette! :D VERY nice!!! 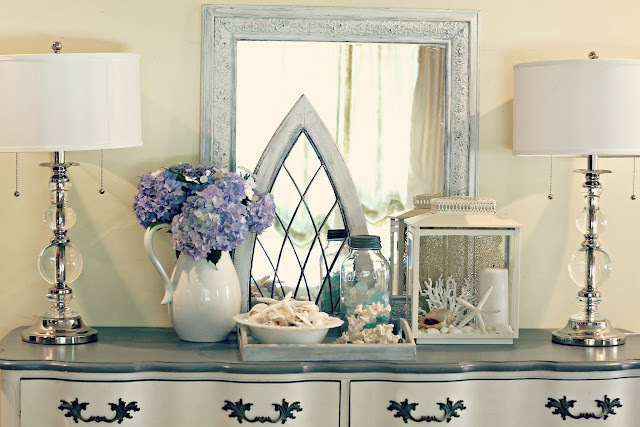 I really like the gothic mirror paired with the hydrangeas. I love it all! Beautiful!! 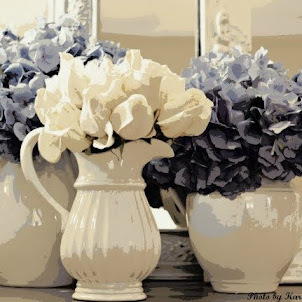 Gorgeous vignette Karen!! I love how you layered! Your beachy vingette is very lovely. I love the way you mixed in the hydrangeas and the sea glass. Hi Karen. I love your vignette. You make it sound so easy poking something here and something there. 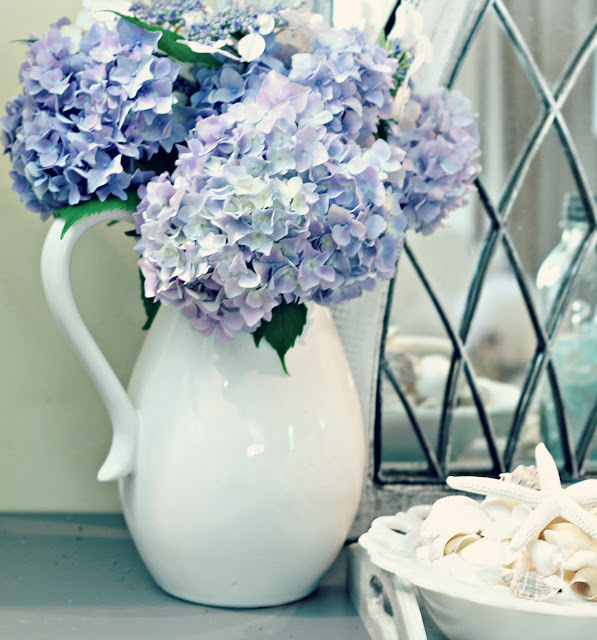 Everything is so pretty and your hydrangeas just set it off. It all looks so very pretty. I love hydrangeas myself. This is STUNNING! I am so happy to have found your blog -- I TOO live in a 1200 Sq Ft house and it is a challenge to make it homey and unique. Your style is wonderful and I love the way you changed this buffet out for the summer. 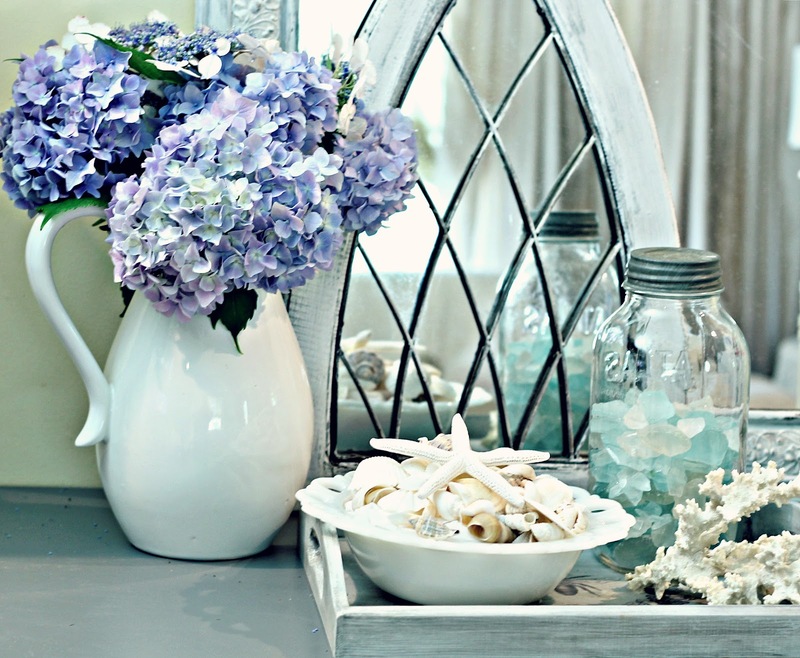 The soft colors of the sea glass and hydrangeas really pull it all together! Oh la la! Karen this is gorgeous. Everything looks so perfect together, each piece compliments the other. I love your mirror! Can I have it?! Kidding! Well, kinda! I love your hydrangeas! Your displays are so pretty and the photography is incredible! This looks so refreshing, clean and pretty. perfect! This is a gorgeous vignette, Karen. 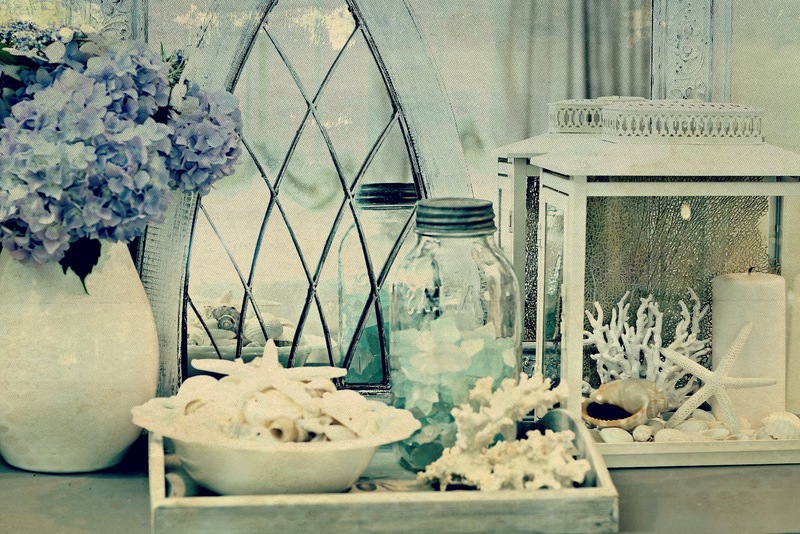 I love the delicate shades in the seaglass, and the hydrangeas are perfect. Everything fits together so well, and is a real treat to look at. That's a great looking buffet to play around with, Karen! 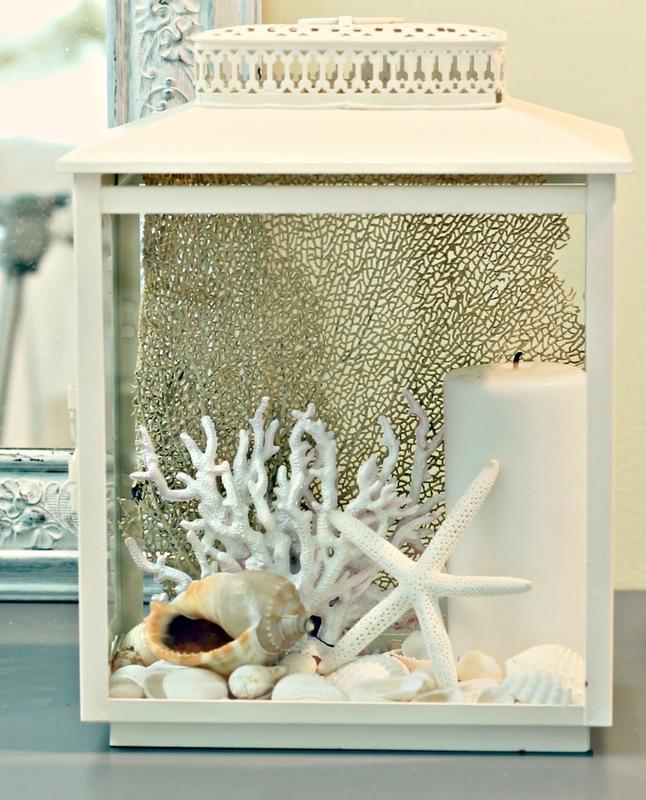 Your Summer vignette looks wonderful on it. Love the lamps and that arched window/mirror. Great lantern ~ it just calls out for more than a candle. Love how it says Summer yet is simple and light looking. You did a wonderful job! Everything is so gorgeous. This is so pretty. I had a lantern filled just like you do. I just love that chest. So pretty! Beachy without being theme-y. You created such a pleasing to the eye display. So Lovely! very beautiful and so summery! This is lovely. The window is gorgeous. Very nice job! Your beautiful washed out summer blues make your vignette so very coastal and dreamy! Your vignette is absolutely gorgeous! It's raining here in New Zealand, our winter but seeing this lovely display makes me remember that it won't be too many more months before Summer and I can walk my little dog down the beach. Visiting from Savvy Southern Style's link party and your newest follower. So beautiful! I love the sea glass. It's all so pretty. So very beautiful! Reminds me of my summers at the Jersey shore too! What a beautiful vignette! I love the jar of sea glass! This is stunning. I am totally in love with the sea glass in the blue jar. Definitely pinning that one! I found a fun linky party to join too...thanks for sharing that...appreciate it! Karen I adore your vignette and the color on your buffet is beautiful!! Gorgeous! I love everything about this - especially the hydrangeas and the sea glass in the jar! Hi Karen! This is Melissa @ daisymaebelle.com. LOVE this vignette! Your moving and moving really paid off! I love the beachy feel! Nice job! I am your newest linky follower. Enjoy your weekend! What a beautiful vignette! So clean a uncluttered but still filled with so many pretty and interesting things. The cool colors work so well. Thanks for sharing with us. Great post! 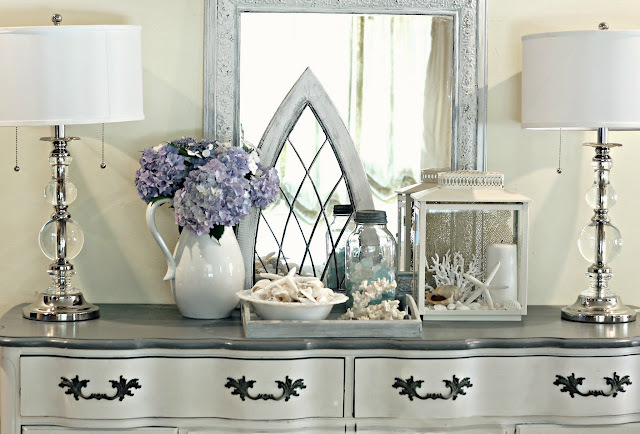 I know you've had a bunch of comments on this and I'm way behind, but you buffet looks great and has my favorite components--seashells, mirrors, white pottery, flowers....love it! 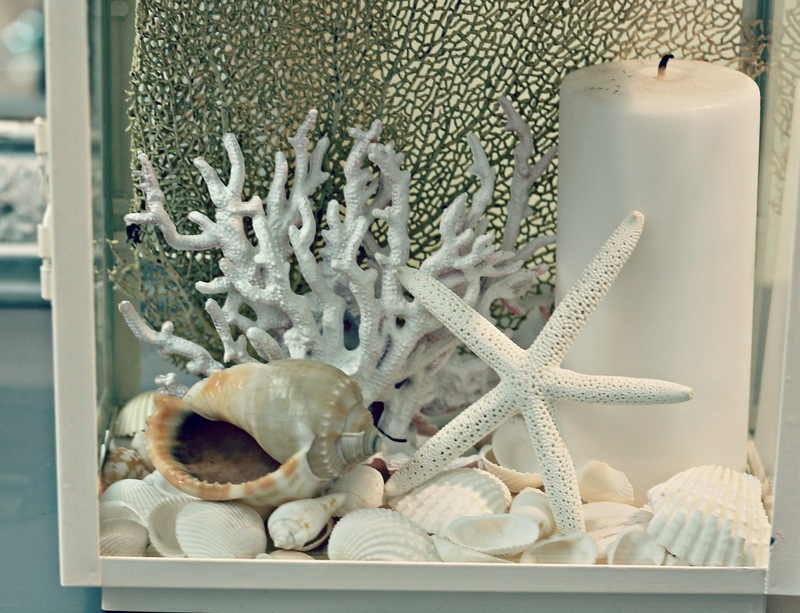 Karen, one of the prettiest beach/seashell vignettes I have ever seen! All of your tweaking was certainly worth it. Thanks so much for sharing it with us. I saw your post over at "Savvy Southern Style". Visiting from Ivy and Elephants party. Wow, so fresh and gorgeous! Everything goes together perfectly! Love all the elements you used, very beachy! 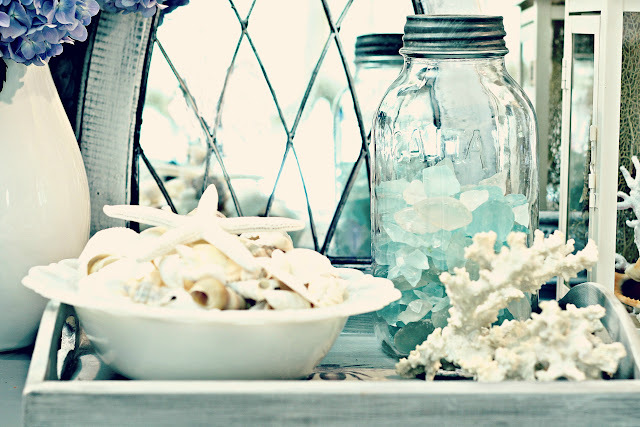 I love the beach glass in the mason jar. 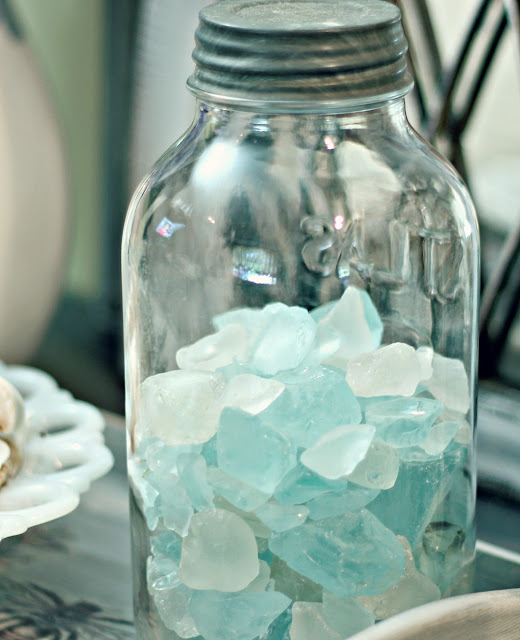 Beach glass + mason jar = great addition to the vignette. I love your gorgeous lantern! Where can I get the lantern exactly like you? Am decorating a room in the beach theme. Saw your post over at "Savvy Southern Style". Thank you for your beautiful ideas! Could you tell me the length, width and depth of your lantern? I am having a problem with trying to describe the lantern to a salesperson. Thank you ever so much.